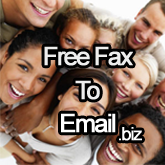 Article: How do faxes work and can I send free faxes? Unfortunately sending faxes is not free, however, affordable charges do apply and you can set your email to fax, or PC to fax service once you have activated your free fax to email service. You receive a premium rate 086 number, issued by Telkom. Although Telkom does not provide you with the fax to email service, Telkom will supply the service provider with the 086 fax number. The service provider iwll then route your 086 faxes through their servers, convert the fax into a TIFF image or PDF file. Early fax machines, which were very similar to today's fax machines, had a revolving wheel (or drum) which pushed the paper through the machine. Early fax machines used a simple technique: If the spot of paper that the photo cell was looking at were white, the fax machine would send one tone; if it were black, it would send a different tone. For example, it might have sent an 800-Hertz tone for white and a 1,300-Hertz tone for black. At the receiving end, there would be a similar rotating-drum mechanism, and some sort of marker to mark on the paper. When the receiving fax machine heard a 1,300-Hertz tone it would apply the pen to the paper, and when it heard an 800-Hertz tone it would take the pen off the paper.